The dentist office just called to schedule cleaning appointments for Austin, Noah and Christian. While it's not awkward for me anymore, I felt really bad for the receptionist! I hope she doesn't beat herself up for it all day long. I have been replaying the beginning of that phone call all morning long in my mind. It was so normal. A part of me wants to just pretend that Christian is still here and I need three appointments in a row, please. What I wouldn't give to have the extra noise and busyness, one more pile of laundry, one more to teach, tired arms from the holding, and a booster seat in the back of my van!!! All you tired mommies out there, you have a tough job. You are exhausted and frazzled and wondering if your kids will ever be able to wipe their hiney by themselves. It takes a lot of grace to get through the little years and it takes a lot of grace and mercy to get through life. God is faithful to give it, if we would just ask Him. I need to ask more often. Do you? I'm in the "trenches" right now, so to speak. I keep trying to remind myself that I signed up for this and to just stand up and take the sleepless nights and the spit up on my shirt and the no time for showers like a soldier. I know I cherish my kids' lives so much more now, what with the past several years and their "owies". This was a much needed post, not just for me, but for someone else out there as well. I definitely need to ask Him more. There are so many times where I get frustrated with the kids for things and then I think about how you would give anything to just go through frustration with Christian. I certainly don't sweat the small stuff so much anymore. I sure miss Christian. It was nice seeing his face in a post this morning. I love you, Marshy....so very, very much! Heb. 4:16 is one of my favorites and one I have prayed for you in the past. I'm so sorry that this came up with the dentist's office although I know handled it very graciously, it must have been painful. I know I've said it before, but thanks again for letting Christ shine through you even in the midst of sadness. I've been reading through Three Go Searching with one of our older kids and the verse Phil 2:15 kept coming to mind as I read your response to this incident - "shining like stars". May He continue to shine through you and give you grace for every single moment. you are so strong! and a beautiful witness to god's grace. Thank you for the beautiful, sweet reminder that our kids are not our own, God will give grace when asked for.....I need to ask more, as well! 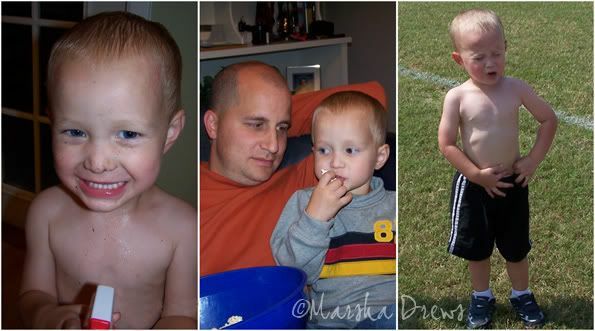 Love those pictures - especially that first one...ALL BOY! all boy must equal always dirty! ;) good thing they are washable! Sigh, what a good reminder to all of us. I know you mostly through mutual cyber friends and you have been an inspiration for me. I totally resonate with the title of your post, girl. In dating (which I am taking a sabbatical from right now, haha), I cringe at the moment of the very normal question "Soo, where does your family live? Parents?" "Ummmm, they are, um, not living any more...".. That whole awkward-no-other-way-around-it response totally is codependent, but, well, er? Sigh. I feel so bad for the guy in that moment, and usually say something lame or a attempt at humor to cut the tension. Blerg. Also, I was just shedding tears thinking of your Christian. Because he deserves my tears, and it will never be enough. The other girls are right-you are an inspiration to those of us still in the trenches. It's not so stinky when we remember there are moms out there who miss it dreadfully. It's true, so true that we will all lose our babies one day. Thank you for that reminder. I'm going to get offline right now and visit my little gal a bit . I was just looking through photos yesterday and, oh, I MISS the baby she was! As Leanne mentioned, I'm the someone else out there. (((HUGS))) and Amein, Marsha. It goes by too incredibly fast. And then, all of that time is just gone, and you can hope you made the best of it, but there will always be regrets. So, cherish each moment, live as steadfastly as you can, and embrace and give all the grace you can to yourself and your children. Shalom to your home, Marsha. The kids all piled on me today and I asked, "You know where Mattias would be right now if he were here? . . . On my head!" He used to climb on the back of the couch and sit on my head and it made me so mad because I hate having my hair pulled. And now I miss that so much.